This August, thirteen Georgia Southern University students and faculty member, Lisa Abbott, took their production of “Do Not Open,” a student devised piece, to the International Fringe Festival in Edinburgh, Scotland. The show was nominated for the Fringe Sustainable Practice Award based on a review of the content of the show and responses to a questionnaire. “Do Not Open” dealt with the idea that the opening of Pandora’s box was not necessarily a bad thing, and that the duality of elements creates a world where the good can be appreciated but only in context with the bad, and that understanding can be reached through the experience of both. 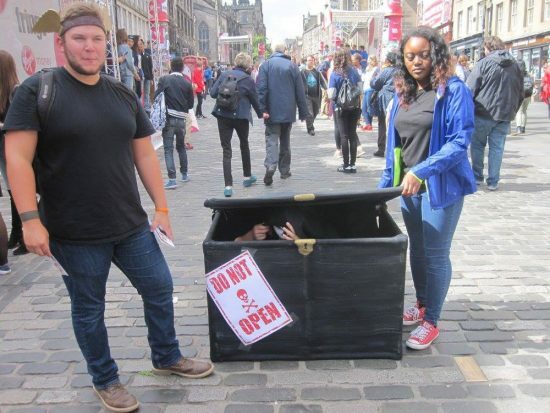 “Do Not Open” was performed in the Space Venue four times during the first week of the Fringe to good houses and was well received by the audiences. One performance included a talk-back discussion with high school and college students on the work of devised theatre and the process by which the show was created. Students created “Do Not Open,” through a Devised Theatre course. Devised Theatre allows students to create a concept and test it out through improvisation, leading to a script and production which may be adapted throughout the performances. “This experience not only allowed students to create theatre as an ensemble, but perform it before an international audience, which made them have to be aware of how the United States is viewed by the larger world. We explored the challenge of satire in this piece and the balance between humor and pathos,” said Abbott. In addition to their own performances, students also were able to take in more than 50 other performances. Abbott also noted that through the Fringe, she connected with faculty and performers from around the globe and engaged in great conversations about the state of theatre and the power of theatre. 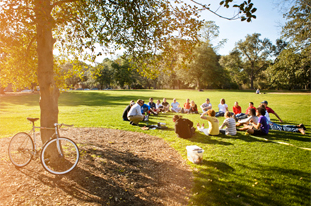 The Fringe Festival originated in 1947 in an effort to support world peace. At the time, eight uninvited theatre companies performed on the outskirts of the festival, and were so popular with audiences that it led to the Edinburgh Festival Fringe now hosting over 3,000 international productions.